This beautiful diamond engagement ring, Henri Daussi H06, is featured with a 1.25ct diamond in the center along with pave set diamonds down the band. 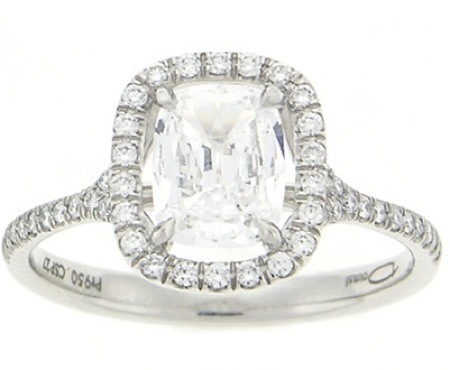 This beautiful engagement ring setting CMKS by Henri Daussi features small round brilliant micro-pave set side diamonds. These diamonds are set around your choice of a center diamond and half way around the band. The ring is currently shown with a .75ct center cushion cut diamond but can be ordered for any shape/size center diamond. Total carat weight may differ depending upon the weight of your center diamond. 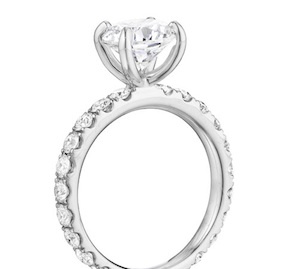 This beautiful engagement ring setting, Henri Daussi CSP features small round brilliant micro-pave set side diamonds. These diamonds are set around your choice of a center diamond as well as half way around the band. This beautiful Henri Daussi engagement ring CMK features .62ct tw of small round brilliant cut micro-pave set side diamonds. 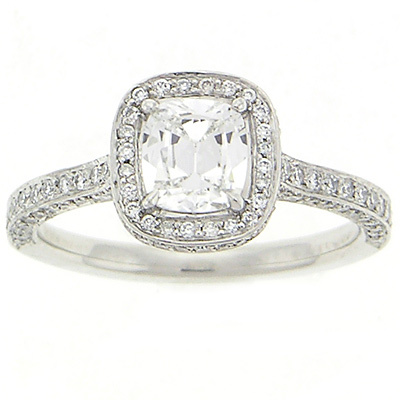 The diamonds are set around your choice of a center stone as well as the basket and half way around the band. The ring is currently shown with a 1.00ct center cushion cut diamond but can be ordered for any shape/size center diamond. Total carat weight may vary depending upon the weight of your center diamond. This beautiful Henri Daussi engagement ring features small round brilliant cut micro-pave set diamonds surrounding the center stone and half way around the band. Available in Platinum, 18kt White Gold, or 18kt Yellow Gold and can accommodate a round brilliant or any shape fancy center stone from .40ct to 6.20ct. Round brilliant micro-pave has a total weight of .65ct, is G-H in color, and VS in clarity. This beautiful Henri Daussi engagement ring features round brilliant cut pave set diamonds around the center stone and down the split shank. This beautiful Henri Daussi engagement ring CWS features small round brilliant cut micro-pave diamonds set around the center stone and half way down the band. The total carat weight of the micro-pave in this image is .25ct, but will vary based on the size of the center stone. Available in Platinum, 18kt White Gold, or 18kt Yellow Gold and can accommodate a round brilliant or fancy shape center stone from .30ct to 5.20ct. This beautiful Henri Daussi engagement ring features .40ct tw of small round brilliant cut micro-pave set diamonds around the center stone and half way around the band. Available in 18kt White Gold, 18kt Yellow Gold or Platinum and can accommodate a round brilliant or fancy shape diamond center stone from .40ct to 6.20ct. Round brilliant micro-pave has a total weight of .40ct is G-H in color and VS in clarity. Image shown with a .75ct Cushion Cut Center stone. Wedding band sold seperately. This beautiful Henri Daussi engagement ring features .20ct of small round brilliant cut pave set side diamonds going 1/2 way around the band. 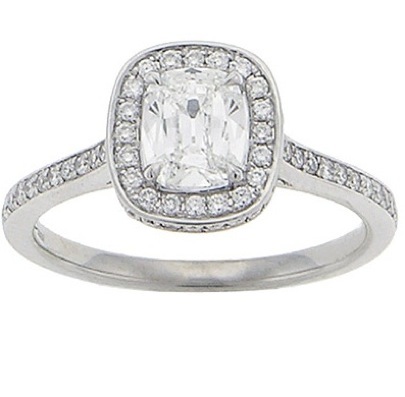 The setting is available in Platinum, 18kt white gold or 18kt yellow gold and can accommodate a round brilliant or fancy shape center stone from .30ct to 5.20ct. This beautiful Henri Dausi engagement ring features .40ct of small round brilliant cut micro pave set diamonds around the center stone of your choice and half way around the band in two rows. 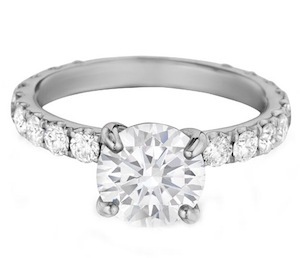 This setting is available in Platinum, 18kt white gold or 18kt yellow gold and can accommodate a round brilliant or fancy shape diamond center stone from .40ct to 6.20ct. The round brilliant micro pave is G/H in color, VS in clarity.